I joined EVE and World War Bee at the start of April, and fought for Pandemic Horde as a “newbean,” taking part in the MBC offensives into Fade and Deklein. By mid-April the Imperium had lost most of its space, save for half of Pure Blind, and parts of Vale of the Silent. With The Mittani declaring his intent to pursue his enemies in a relentless “Hellwar” after the break-up of the MBC it seemed for a moment that the fighting might be over. 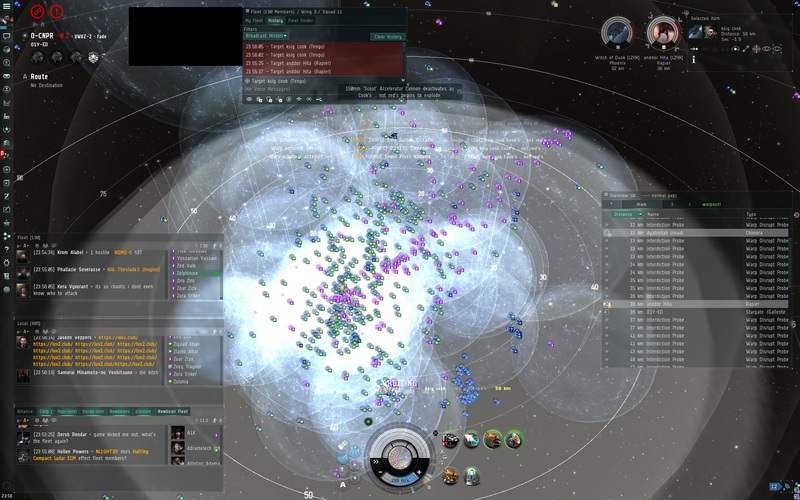 Then on the Saturday of 16 April, Goonswarm Federation FC DaBigRedBoat publically declared on stream that he would capture Horde’s staging system of O1Y-ED in Fade by Monday. Fighting ramped up immediately, and on 17 April an outnumbered Imperium fleet led by Asher Elias won a significant tactical victory, inflicting heavy losses on PH, most of them with a series of textbook stealth bomber attacks. However, the swift arrival of MBC allies prevented the Imperium from winning the entosis fight, leaving them unable to capture the station. Imperium bombers continue to pose one of the greatest dangers for Pandemic Horde fleets, and Asher in particular is an evangelist for the use of bombers in nullsec, as well as being familiar with fighting while outnumbered. He’s also familiar with Pandemic Horde, having spent some time down in the Querious Thunderdome before the War. Many Horde pilots soon received a crash course in how to survive in a bomber-heavy environment, with hard lessons learned in cost of lost ships. At the time, I was still operating up in Deklein, guarding the final entosis operations and harassing Imperium stragglers around Karmafleet’s staging system of 3T7-M8 (which Darkness renamed to “JOIN HORDE TO EVAC” in recognition of the help PH provided). As it became clear that this was a serious push, I relocated back to Fade in my Merlin frigate, Badacadabra. I promptly ran into Elo Knight’s White Legion mercenaries (hired to fight for the Imperium) standing a few hundred km off the O1Y station in a large fleet of Munin heavy assault cruisers. Attempting to slip around behind them to provide a potential warp in point for a fleet of Travis Keikira’s Ferox battlecruisers I quickly learned two things. Firstly, that travelling too far from the main body of the fleet and attempting to solo flank the enemy is an excellent way to get noticed. Secondly, that Munins with 720mm Howitzers and the appropriate skills and mods can hit Merlins at over 100km away. I saw yellow boxes on three of the enemy indicating that they were targeting me, and then Badacadabra exploded gloriously, joining my ever growing list of Merlin casualties. It was a fitting welcome home. Although the main Imperium attack had been repulsed, Imperium stealth bombers had now become a permanent presence in O1Y. Early attempts to deal with them met with poor results, such as attempts to bait them into traps while operating on Horde mumble coms when the Goons had spies listening in. Nevertheless, impromptu counter espionage white-noise strategies certainly generated a great deal of amusement. Actual Horde coms from actual Travis Keikira operations, video image may or may not be representative of actual Horde members. 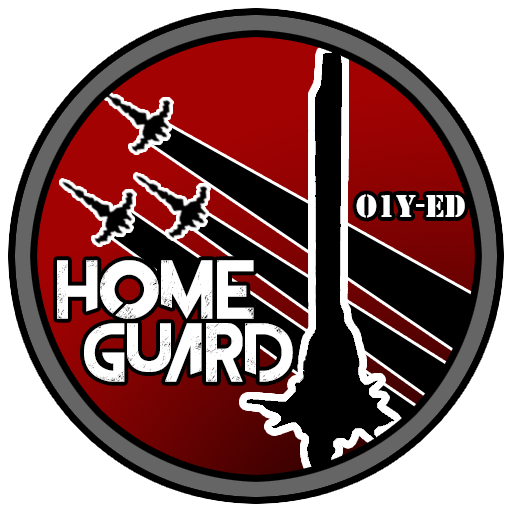 The O1Y standing fleet began to re-organize itself from a mostly chaotic ratting fleet into a more responsive PvP force in order to face this new challenge, and after Dartias Krawss created a sweet patch for the defenders, it became widely known as the O1Y Homeguard. Dartias deliberately left the PH logo off the patch so it would be applicable to the other alliances that were helping in the defense, in particular Waffles and the Spaceship Samurai Alliance (alliance ticker HONOR) who would provide Horde invaluable support in the days ahead. 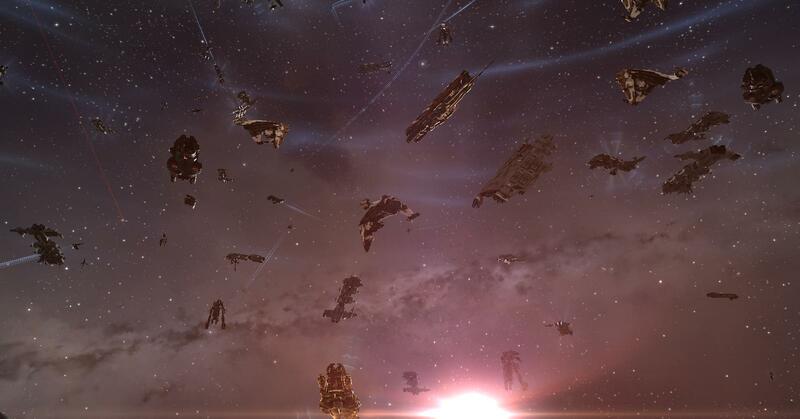 With O1Y now regularly topping DOTLAN’s lists as the most violent system in nullsec (and often New Eden), some Horde ratters and miners moved out into the surrounding systems, and the Homeguard expanded its operations throughout the UWRZ-2 constellation. Patrolling these systems often meant long hours of nothing, with occasional moments of pure panic for punctuation. In one such moment, I was in my latest Merlin, Witchness, bouncing between several friendly ratters in the K4YZ-Y system, with reds in local. I came out of warp near a friendly Vexor Navy Issue cruiser just as a Goonswarm Stratios decloaked on top of the ratter and attacked, throwing down neuts and warp scramblers. I lit my microwarpdrive and closed into range in seconds, locking up the Stratios and hitting him with my long range warp disruptor even as the Vexor typed a desperate “wwwwww” out in fleet chat to summon assistance. This allowed any pilots in the same fleet and in the same system to immediately warp to his location. As the first reinforcements started to arrive I slapped my shorter ranged warp scrambler onto the Stratios, and then orbited it at 1km, firing away with my popguns. “Stratios in K4 pointed and scrammed,” I called out on the O1Y standing fleet channel, “He’s not going anywhere.” I really hoped he wasn’t, and that he wouldn’t kill me before help arrived. But a daring escape wasn’t in the cards for this particular raider. Another newly arrived Merlin added its point to my own as insurance, and a small squadron of Horde Svipul destroyers landed a moment later. In short order the now badly mobbed Stratios exploded, the Goon pilot making a hasty escape in his pod. “Nice trap. :P” he called out in local, and then jumped clear of the system, while I surreptitiously looted enough from the wreck he left behind to pay for half-a-dozen more Merlins. While these small skirmishes were going on around Fade, Khan Gobbins led a massive entosis fleet of 220 ships into Pure Blind, and took the entire Goon constellation of S-4GH. According to Gobbins the loss of this constellation destroyed a key Imperium jump bridge into Fade, which had been allowing the enemy to circumvent many of our allies’ defenses and attack us directly. The effects of this were immediately apparent as the next day an Imperium cruiser fleet was cut off and wiped out in Pure Blind, likely after being forced to take the long way round to Fade. Nevertheless, the Imperium attacks were persistent, and the 1 ADM systems in the southern constellation of 7X-X1Y had been slowly falling into the hands of the GSF since the start of the Goon offensive. 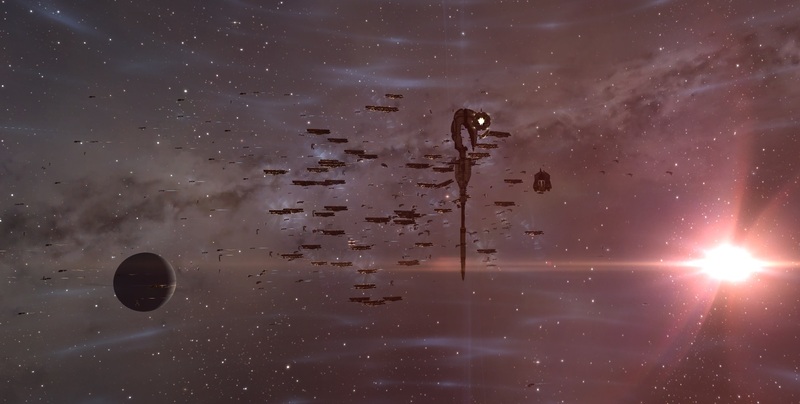 On 22 April, a large Imperium entosis operation was reported in the system of YKSC-A, and I joined Witchness to a hastily formed response fleet led by Scion Koga, an FC from Spaceship Samurai. 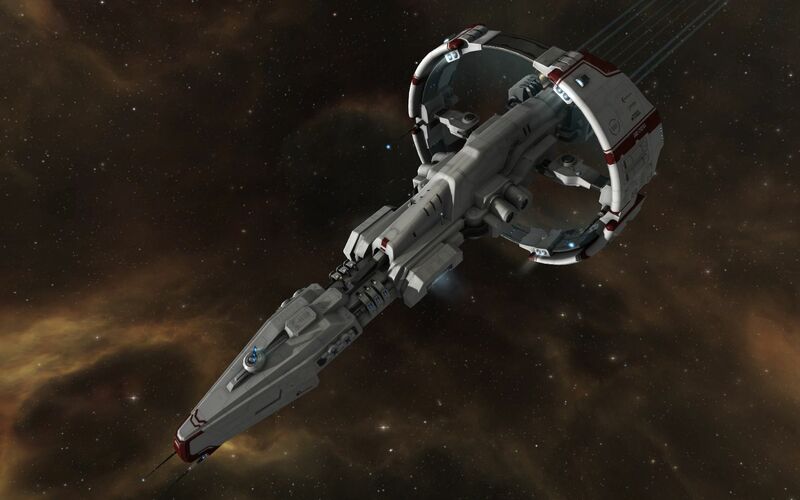 Forward scouts reported that an enemy fleet of Dominix battleships and Loki cruisers surrounding an Archon carrier was defending on the in-gate in YKSC-A. Wondering if we had the firepower to take them we jumped in and engaged. Interdictor bubbles popped up all over as our Caracal cruisers began flinging missiles at the Archon. Spying a Loki outside one of the bubbles I raced towards him and tackled him. For a moment the battle seemed in the balance as our logistics ships starting to go down, but the scent of a carrier kill was drawing in additional Horde and Waffles pilots, and after a fortuitous call to switch fire to drones the battle started to tip in our favour. After the Loki I had tackled was killed, I started bouncing between outlying Dominix battleships to ensure they went nowhere, before everyone turned their fire back on the helpless carrier. The carrier detonated under fire from 170 ships, and I had my name on a carrier killmail! Despite losing the carrier and its battleship escorts however, the enemy fleet had managed to hold the line long enough for their entosis of YKSC-A to complete, and the system shortly fell into Imperium hands. The Imperium also managed to score a significant entosis success in O1Y that weekend, reinforcing the O1Y station, after Asher Elias managed to outmaneuver and outfight several larger MBC fleets. The station was due to come out of reinforcement on 26 April, and although there had been no call for “all hands on deck,” there was a general feeling around Horde that this was a timer that shouldn’t be missed. As the clock counted down on the 26th masses of PH pilots began to log in, and soon there were over 600 pilots floating around the POS we were using for the formup, in three separate fleets of Typhoon battleships, Cormorant destroyers, and entosis Mallers. Spaceship Samurai added a force of 30 Gila cruisers and a pair of dreadnoughts, and Mordus Angels brought 30 Confessor destroyers. Someone even brought a Drake. Having missed the large battles of March, it was the largest single fleet I’d seen in game to date. FCs repeatedly instructed pilots to turn down their graphics settings, and turn off audio, so as to reduce the stress on our machines in the event that a large battle developed. As I circled it in my Cormorant destroyer Boxbird II (Boxbird the original perished several weeks earlier to a White Legion gatecamp), even with my PC now in potato mode I couldn’t help but be impressed. There was a general feeling among the fleet that the Goons wouldn’t show, and the whole thing would be a bust. But an Imperium fleet of some 200 ships left Saranen and was working its way down through Cloud Ring on its way to Fade when it was ambushed by TISHU (who I was later informed had Built a Wall in Cloud Ring to Make Fade Great Again) and NCdot in the 6RCQ-V system and was destroyed. Once again the loss of the jump bridges into Fade appeared to have unhinged Imperium offensive plans. While we were waiting in X36Y-G for an enemy who would now never come, we received a report that a group of wormholers from the Lazerhawks corporation had emerged in the nearby O-CNPR system, and were camping the gate to O1Y with a fleet of about 30 odd ships, including a Phoenix dreadnought, and a Chimera carrier. Displaying balls of depleted uranium, the Lazerhawks made no attempt to run even as O-C local ballooned with the arrival of hundreds of battle crazed Hordlings. Taking the offered challenge, our Typhoon fleet descended on them and a massive brawl exploded around the O1Y gate. Flying fast locking Cormorant destroyers in the entosis guard fleet intended for fighting interceptors, our ships were poorly fitted for taking on the Lazerhawk capitals, and our FC held us in an overwatch position several hundred km back from the battle while our entosis ships continued to fortify the various station nodes. When it became clear that no Goon interceptors were in the offing, we too engaged, bringing the total number dogpiling the wormholers to well over 400 ships. Lazerhawks went down swinging, managing to hold the line for several more minutes with some skilled logi work, even killing one of the HONOR dreadnoughts in the last seconds of the battle, before they were overwhelmed. Aside from fighting like Spartans, Lazerhawks turned what could otherwise have been a bit of an anticlimax into a highlight for many Horde Newbeans. 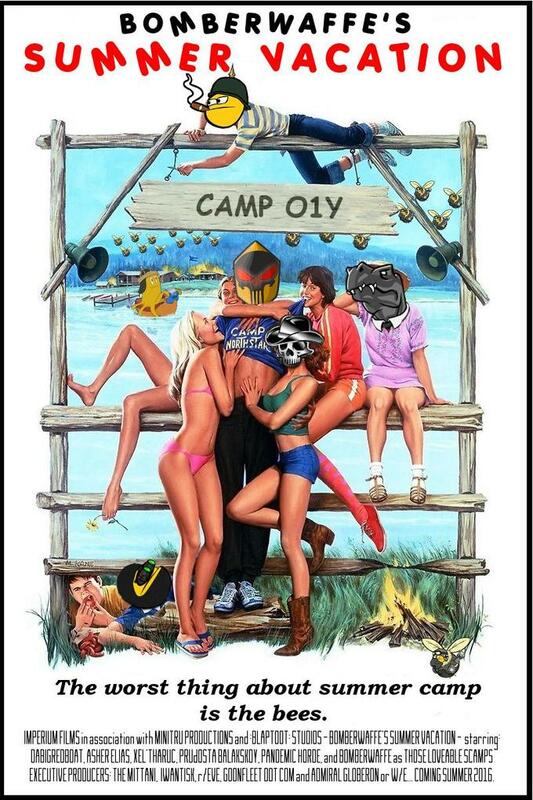 From the excitement on coms, and the posts on reddit afterwards, the 600 pilot formup was a huge morale boost to Horde, and gave everyone renewed confidence that no matter what the next few weeks brought, the Goons would have no easy time evicting us from the only home that many of Horde’s war recruits had ever known. The story continues – catch part two of The Battle for Fade tomorrow!